Rian participated in the congress in Prague (2007) for the first time. During the congress in Beijing (2009) she has been elected as a board member (for coordination IPRS) and in Gent (2011) Rian also became vice president of Intersteno. During the congress in Berlin (2017) she has been elected as president of Intersteno. Born on February 25, 1954, Russell Page is the president/owner of Derenberger & Page Reporting in Washington, D.C. He is a graduate of the University of Connecticut where he majored in English but also studied French at Universite de Rouen, France in his third year. He completed a program in stenotype reporting in 1978 in Virginia Beach, Virginia where he worked for one year before returning to Washington, D.C. in 1979. 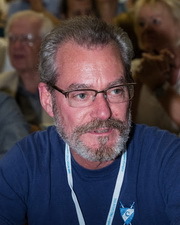 He helped to establish the Greater Washington Shorthand Reporters Association in 1985 and served in various board positions until he became president in 1995. He was chief examiner for NCRA in Washington for five years before serving on different NCRA committees dealing with certification of reporters. He is currently co-chair of NCRA’s Test Advisory Committee. Russell attended the Paris and Ghent Intersteno Congresses as a volunteer to help with the realtime competitions. He became a member of Intersteno’s board and U.S. representative in 2015 in Budapest. Danny Devriendt is in daily life head of the ICT and informatics teacher training section at the Artevelde University College Ghent (Belgium) [www.arteveldehs.be] and president of the Academie voor Bureauwetenschappen [www.abw.be], an organization that groups about 300 teachers in ICT, especially word processing. He’s author of a lot of school books in word processing and webdesign [www.wwwsoft.be] and ICT-teacher in a commercial school in Brugge [www.sintjozefbrugge.be]. Since 1977 he participates on regular base at INTERSTENO-congresses, was secretary-general (2001-2003) and is since 2003, according to the new constitution, secretary-treasurer of Intersteno. 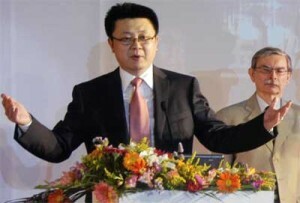 He was again nominated Secretary Treasurer by the Assembly in Vienna 2005, Prague 2007 , Beijing 2009, Paris 2011. From then, he was also coordinator of the organization committee of the 49th INTERSTENO congress very successfully held in Ghent (Belgium) 2013. After some years as a multilingual secretary, Georgette Sante became a teacher for the Belgian French Community (Official secondary teaching in South Belgium). As a member of the APSB (Teachers’ Association for Office and Secretariat), she has taken part in the organization of championships for students; one of them was held in her school (Esneux in 1989). Being interested in computers, she rapidly introduced her students to Wordprocessing (instead of only typewriting) rather than waiting for the official school programs to incorporate itc into the official programs. In 1990, with some other APSB-teachers, she organized the first contest of word processing. 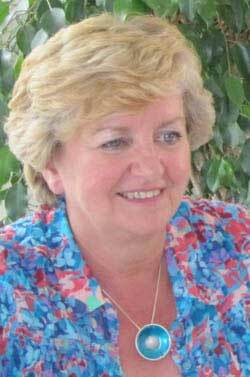 In 1991, she joins the Intersteno Belgium team and takes part in the organization of the 39e Intersteno congress. In 1999, she represents Belgium at the Intersteno Central Committee in Vienna. Since this period, according to the linguistic agreements for Belgium, she is the Belgian official delegate, alternatively with a Dutch-speaking delegate; however, during the years “without mandate”, she takes part in the activities of the association, attends congresses and committee meetings. According to the new structure of Intersteno Jury, she becomes, in September 2006, coordinator of the Professional Wordprocessing championship and in July 2007 was named Jury President at the Congress in Prague. Thanks to her successful work, she was again confirmed in this Chair by the Beijing, Paris and Ghent Councils. Carlo Eugeni graduated in Conference Interpreting and Translation at the SSLMIT of the University of Bologna. He is Philosophy Doctor in English for Special Purposes with a thesis on live subtitling by means of speech recognition technology. As a freelancer he works as a technical translator and a conference interpreter. As a subtitler he produces pre-recorded subtitles for RAI teletext and live subtitles for several associations in defence of deaf people. As a freelance trainer he prepares university students and professionals alike to the use of speech recognition technology both in the field of subtitling for the deaf and the hard-of-hearing and of reporting. As a freelance lecturer, he has been teaching Conference Interpreting, Translation, Multimedia Translation, and French for Special Purposes since 2005 for the Universities of Macerata, Perugia, Parma and Roma Tre. As a freelance researcher he has collaborated to several international (Voice, DTV4All, EU-Bridge, SAVAS) and national (Subtitle, SALES, Lectio Subtitulis, SCRIBE) projects and studies on audiovisual translation and accessibility. He has extensively published in English, French and Italian on respeaking and on related aspects (mainly professional and didactic). He is the organiser of the international seminar on real-time intralingual subtitling, a member of the Italian Academy on Multimedia Writing and Communication and the HR manager of the International Association on Respeaking onA.I.R. Emrah Kuyumcu, born in 1986, graduated in Geological Engineering at Istanbul University and then Business Administration (BS) at Anadolu University (2012). 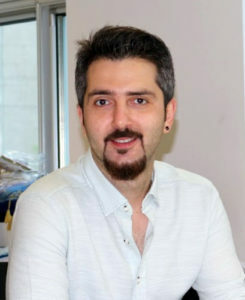 Served as Team Leader of Data Processing for several years in Trans Atlantic Petroleum Ltd (US), a leading oil company in Turkey, Earlier he served as educator for web and informatics in Şampiyon Computer Education Centre, a freelance webmaster and keyboarding reporter for various companies and as a trainee for data and word processing at Istanbul University. He has been working in his own digital agency, Grafela in the business of web services and solutions in Turkey since 2008. His services include serving and consulting for websites, digital services, designing, teaching web and informatics. He is also working as founder of Canlı Deşifre Conference Reporting Services, which is the leading company in Turkey for conference reporting, real-time audio transcriptions and live-subtitling business. He has entered Intersteno competitions since 2003, being mainly placed in top four and is still actively competing in the Turkish National Group. He managed the evaluation of Turkish keyboarding methods for use in the multilingual internet contests of Intersteno-Turk. In addition, he created the official website of the Intersteno Turkish Group in 2005, prepared a new visual layout of Intersteno.org website in 2009-2014 and has been actively serving as web and digital media officer in the Intersteno Federation. Since 2013 he is working in the Board of the F-Keyboard and Information Processing Association in the Turkish National Group and in 2017 he became the President of the Association. 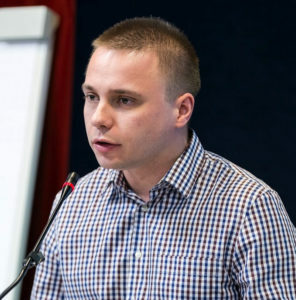 Born in 1990, graduated Silesian University of Technology as an engineer. He also studied in Germany at Stuttgart Universität. In daily life he works as an electronics engineer. Active member of Polish Association Interinfo Polska since foundation in 2004. In 2007 during first organized by Interinfo Polska Polish Championship he became a Polish champion in touch typing. The first Congress that he attended was in Prague in 2007, when Poland became the member of Intersteno. In 2008 he was part of an organizing committee for the Council Meeting in Tychy. Since Congress in Ghent 2013 he is not only the competitor, but also a coordinator of Polish national team and a Council member. In Berlin 2017 he has been elected as member of the Intersteno Board.